St. Lukes Church celebrated its 225th anniversary during 2000/2001. The congregation was organized in 1776 by the Rev. Johann Gottfried Arends, a school teacher from Gottingen, Germany who became the first ordained Lutheran minister in North Carolina and first president of the North Carolina Synod of the Lutheran Church. St. Lukes is the oldest Lutheran congregation in Lincoln County, North Carolina. St. Lukes was not always known by its current name. 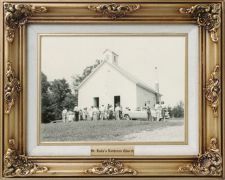 It was called Lebanon, then Liberty and later referred by the community as Ore Bank Church because of the rich iron deposits found in the surrounding hills. The name was changed to St. Lukes in 1858. The first Church was built of logs followed by a frame dwelling in 1857. That Church stood until 1974 when a brick structure was erected. A wooden cross, hanging over the altar, was fashioned from the boards of the old Church, as is the altar top and railings. For most of its life, St. Lukes has been served by interim, multiple point parish, and part-time pastors. The current pastor is a member of the faculty of Lenoir-Rhyne College, Hickory, NC and serves also as pastor of the congregation. St. Lukes is affiliated with the Lutheran Church Missouri Synod, Southeastern District and is located ¼ mile south of Highway 150 on King Wilkinson Road in rural Lincoln County, North Carolina. Click here to email us with questions or comments about this site.